80% Virgin Wool 20% Polyamid. Length: 21". Waist: 34". Multiple animal prints, such as zebra, giraffe, etc. Lightweight, great for spring or fall. 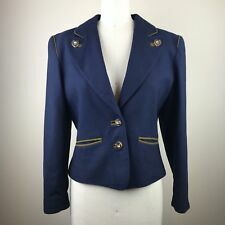 Womens Merona Jacket Size Small Versatile, professional, dress , or casual. Geometric print. Very lightly used, no damage or defects. See photos for details. Women Wool Dress Coat. Condition is Pre-owned. Shipped with USPS Priority Mail. White House Black Market, Size 8, Black, Satin, Pleated Ruffle, Rosette, Dress Trench Coat. Satin Roses on Lapel. Two Layers of Ruffles, Pleated Ruffles & Regular Ruffles on Collar. 100% Polyester. Lot Of 2; Zara Coat Size XS, Zara Dress Size XS (NEW). Our main focus is the resale ofauthentic designer clothing, shoes, handbags and accessories. Does not diminish the overall appearance of the item.Very Good - Well-maintained. Coast Black Linen Dress Coat. Ivory silk embroidery to front, sleeves and back. This beautiful black spring coat in very nice condition. The front of this coat has a double row of buttons and. It is made of a soft lightweight 100% polyester fabric. The color is black. However, we are only human and mistakes can happen. This is due to a number of factors such as; lighting, different monitor resolutions and/or cell phone screen resolutions. top of shoulder to bottom: 11".